Get Jobs For Catering Services in Dubai in Central Point Catering Services. You will be amazed to see the opportunity what I am going to keep in front of you. You guys are invited for multiple applications offering by Central Point Catering Services for the following mentioned below. Please be noted that all of them required education and experience which can be seen below along with its complete details. We preferably Indian, Pakistani, Filipino and Nepali nationalities. Other than would not be accepted. All of above positions need to be filled with high school degree/diploma and 2 years of catering experience in the similar field. 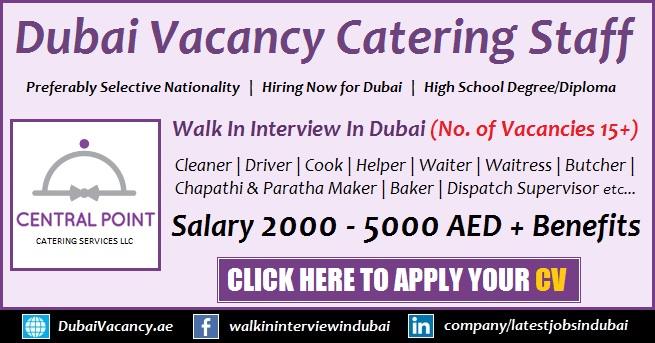 How To Apply Jobs For Catering Services in Dubai? Walk in Interview will be conducted tomorrow on Wednesday, 11th of October 2017 and will be ended on the same day means tomorrow. I would make sure you that tomorrow will be the last date of the interview because it is specified by the employer. So if you are the one interested candidates and having the capability to fulfill the criteria above then you are being requested to come with your updated CV, academic certificates, experience certificates (if any) along with a copy of your passport and UAE visa at the following location below. Location: Central Point Catering Services LLC, DIP 2 (Dubai Investment Park), Plot No. 597-1030, Behind Gulf News Printing and Fida Al Madeena Supermarket.